Cocoa hydrates your skin, making it firmer and more supple, Dr. Bank says. "And dark chocolate contains high levels of flavonols, a potent type of antioxidant," adds Nicholas Perricone, MD, a dermatologist in New York City. 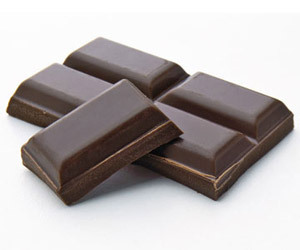 For maximum flavonol content, eat chocolate that's at least 70 percent cacao. A couple of squares a day should be enough to improve luminosity. "When applied topically, the caffeine in chocolate may temporarily reduce skin puffiness," says Jessica Wu, MD, a dermatologist in Los Angeles and the author of Feed Your Face. Try cocoa-rich 100% Pure Cocoa Kona Coffee Body Cream ($15, 100percentpure.com). The protein you get from eating dairy helps skin become firmer, so it's more resistant to lines, Dr. Wu says. Greek yogurt is especially beneficial. 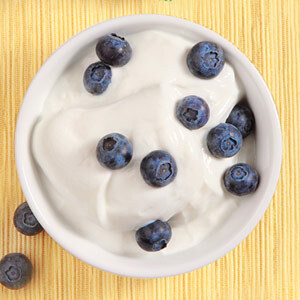 "The protein content is often double that of regular yogurt," Dr. Perricone adds. Eat a single serving daily to make your complexion smoother, and apply Korres Yoghurt Instant Soothing Gel ($38, sephora.com) to calm irritated, dry, or sensitive skin. They're packed with polyphenol antioxidants, Dr. Perricone says. Polyphenols fight free radicals and regulate skin's blood flow, giving it rosiness. One pomegranate or a few glasses of juice daily should do the trick. When applied to skin, the fruits' antioxidants help smooth lines and moisturize, Dr. Bank says. 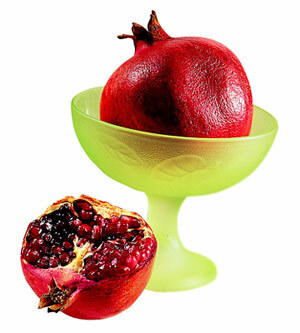 Reduce wrinkles with Grassroots Research Labs Pomegranate Super Anti-Oxidant Cream ($35, kohls.com). 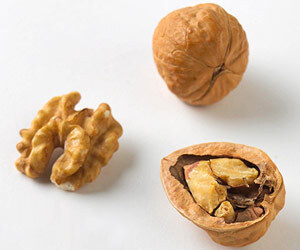 "Walnuts contain omega-3 essential fatty acids, which can improve skin's elasticity," Dr. Bank says. The nuts are also loaded with copper, a mineral that boosts collagen production. Snack on a handful of walnuts each day to improve your complexion's texture, and slough tough calluses with True Blue Spa Smoothing Foot Scrub Toe the Line ($15, bathandbodyworks.com). The ground walnut it contains acts as an exfoliant. "Women who eat green and yellow vegetables regularly tend to have fewer wrinkles, especially around the eyes," Dr. Wu says. Also, studies found that carotenoids -- the antioxidants in yellow and orange veggies -- can decrease skin's sensitivity to the sun, Dr. Bank says. 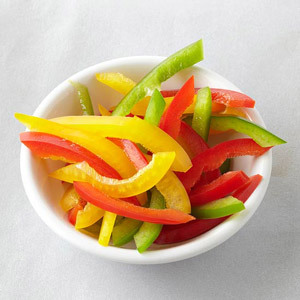 Aim for about two cups of peppers daily. 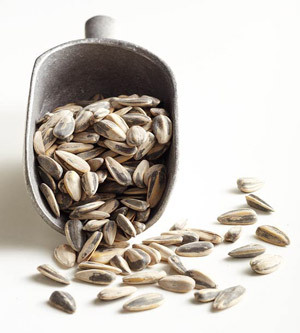 Loaded with vitamin E, sunflower seeds keep your skin supple by protecting its top layers from the sun. Eat a handful daily. A high essential-fatty-acid content makes sunflower seed oil a treat for parched body parts, such as lips and heels, when topically applied, Dr. Bank says. Fight flakes with Dr. Brandt Lineless Lines No More for Lips ($30, drbrandtskincare.com). They're high in zinc, and studies indicate a correlation between blemishes and low zinc levels, Dr. Wu explains. "That may be because of zinc's healing properties." 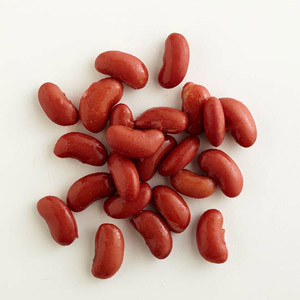 Have a four-ounce serving of kidney beans to help you stay in the clear. In addition, studies show topical zinc to be as effective against acne as antibiotics are. Body lotions with zinc, like Dial NutriSkin Replenishing Lotion with BioNutrients Soothing ($7, drugstores), may kill blemish-causing bacteria. Drink a latte with soy milk or eat edamame and you may get a clearer complexion. 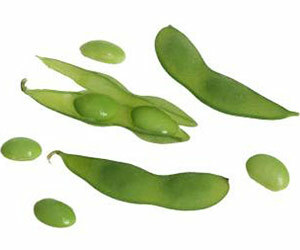 "Soy contains minerals and proteins that have been shown to reduce hyperpigmentation," Dr. Bank says. One cup a day should yield results. Or smooth on soy-infused Elizabeth Arden Prevage Clarity Targeted Skin Tone Corrector ($125, elizabetharden.com) to help prevent sun spots. 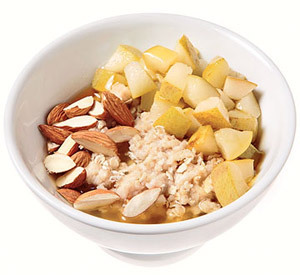 Steel-cut oatmeal is less processed than other varieties, so it retains more vitamins. 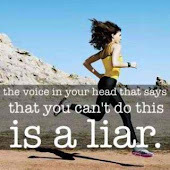 "Plus, it takes longer to break down in your body, which helps keep your blood sugar stable," Dr. Wu says. 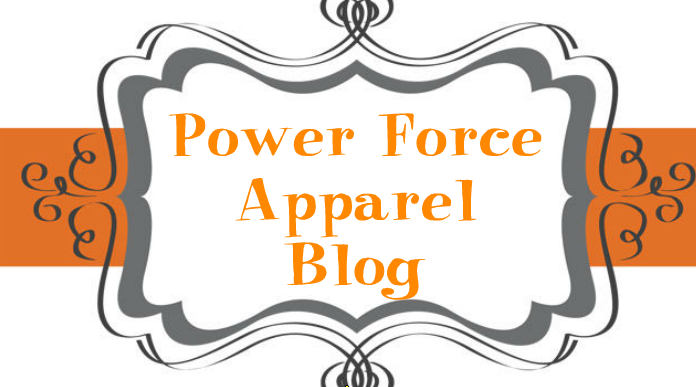 "This is important because studies found that spiked blood sugar elevates your body's level of androgens, hormones that can contribute to wrinkles." Oats are also exceptionally skin healing. Lessen irritation with St. Ives Naturally Soothing Oatmeal & Shea Butter Body Lotion ($5, drugstores). "It's very high in antioxidants, particularly one named EGCG, which is proved to reduce redness," says Jeffrey Morrison, MD, nutrition consultant for Equinox Sports Clubs in New York City. 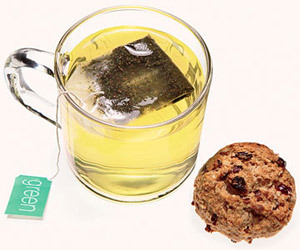 "Studies have also demonstrated that green tea helps fight inflammation," Dr. Bank says. Sip at least one cup of green tea a day, and fight redness with Dr. Andrew Weil for Origins The Way of the Bath Matcha Tea Body Soak ($45, Origins stores).